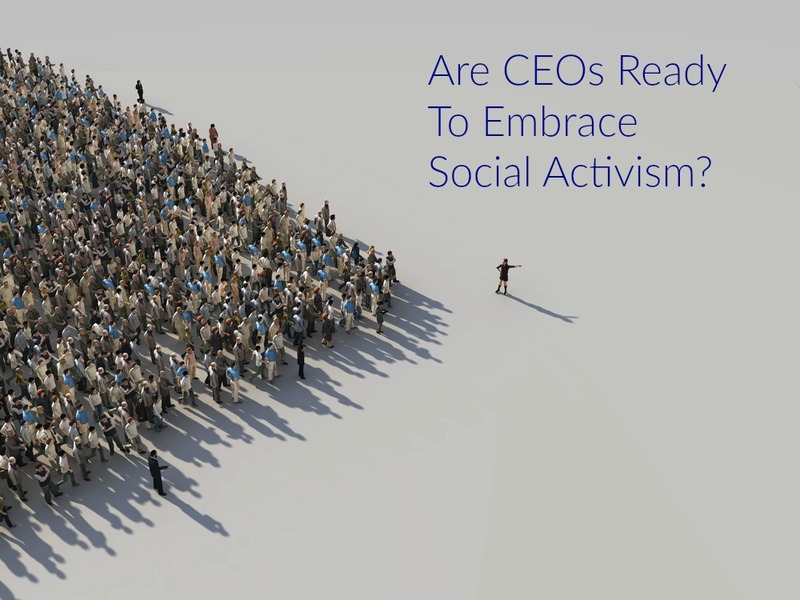 Are CEOs Ready To Embrace Social Activism? For years, public relations and reputation experts have promoted CEO activism and corporate social responsibility, preaching its benefits and warning of limits and pitfalls. But for many corporate communicators, the position was lonely. For some companies, the embrace of social change programming was little more than lip service — maybe a dignified corporate social responsibility report on environmental stewardship, or a donation-with-purchase campaign to benefit a nonprofit. Others waded into politically charged waters, but retreated when they hit the inevitable backlash. But things are changing rapidly on the corporate activism front. As the Harvard Business Review has discovered, “PR firms are now building entire practices around CEO activism.” Imagine! But if you haven’t noticed the trend, you haven’t been paying attention. In the past three years, CEOs in sectors from technology to banking have spoken out on controversial or even divisive issues like immigration, marriage equality or climate change. And on Tuesday, the stakes for corporate activism grew. Laurence Fink, founder and CEO of powerful investment firm BlackRock, basically gave top business leaders their marching orders in a public letter. Every company must not only deliver on financial performance, wrote Fink, but “also show how it makes a positive contribution to society.” Fink essentially told corporate America that if it wants the support of BlackRock, the largest investor in the world at $6 trillion in assets, it must do well by doing good. That kind of call to action is one thing coming from longtime activist corporate leaders like Seventh Generation’s David Bronner, or a renegade technology entrepreneur like Elon Musk. But when the hard-nosed leader of the largest investor in the world lays down the law on social activism to big business, corporate activism has gone mainstream. What has tipped us over into this new era? An improving economic picture certainly helps. Corporations are likely to be risk-averse in a declining economy but gain confidence in a stronger and more competitive marketplace. More importantly, as we approach full employment, recruiting and retention become even greater business imperatives. With millennials in particular, a strong reputation is a key asset in the battle to attract top talent. And increasingly that means an authentic embrace of social activism. Then, too, after a year of chaos and controversy under the Trump administration, more Americans are looking to the private sector for stability, leadership, and even positive social change. In the wake of the most significant corporate tax cut in decades, Fink reminds CEOs that “stakeholders are demanding that companies exercise leadership on a broader range of issues,” citing the impact of automation and resulting infrastructure and worker retraining needs. Now is the time for corporate communicators, PR partners, and the C-suite to collaborate on social programs that are brand-relevant, meaningful, and long-lived. As a starting point, here are some guidelines for developing campaigns around hot-button issues. For corporate leaders, the stakes will only get higher.